A walk along Grand Street in Mamaroneck is much like a walk along any other street in the suburbs around New York City. That is until you reach number 175. Known as the Seely House, it has the same homey charm as its neighbors, with one exception: It’s only 10 feet wide. 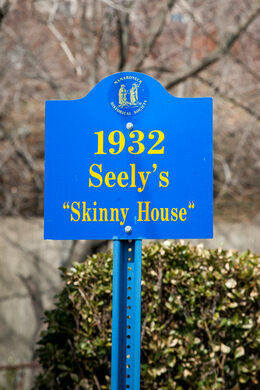 The house was built in 1932 by a local contractor named Nathan Seely. In the boom years of the 1920s, Nathan ran a successful home-building company together with his brother, Willard. They bought land in Mamaroneck and built houses for the African-Americans moving from the South during the Great Migration. The Stock Market Crash of 1929 changed everything. Nathan Seely lost his business, and the beautiful home he built for his wife Lillian went into foreclosure. 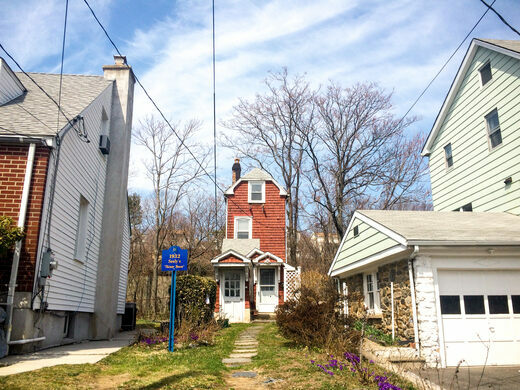 Left with nothing, Nathan’s friend and neighbor Panfilo Santangelo offered him a 12 1/2-foot-wide strip of land that ran between the two houses. To seal the deal, Nathan paid Panfilo one dollar. With no money to buy materials, Nathan used whatever he could find: the basement was held up by a salvaged railroad tie; a chicken coop was used in the living room. Nearing completion, Nathan tethered his new three-story home to the ground with steel cables, to keep it stable in high winds. The Seelys lived at number 175 until 1962, when Nathan passed away. In 1988, Panfilo’s daughter, Ida, bought the house from the Seely family, and began renting it out. It is still owned by the Santangelo family, and while it sat empty for a number of years (a bad case of termites), it is once again occupied as of September 2017. 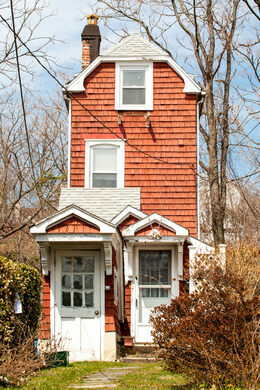 A desire to preserve this odd, little house runs deep in both Nathan and Panfilo’s descendants. 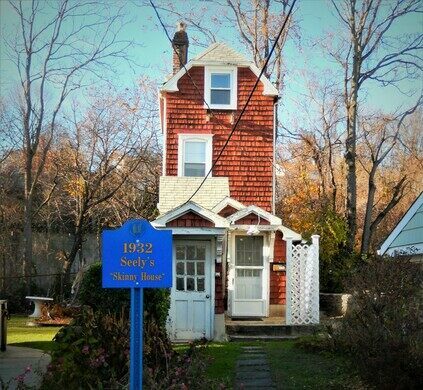 The Santangelos are working to raise funds for restoration, while Nathan’s great-granddaughter, Julie, is working on a book called Skinny House, with proceeds to go toward the repairs. In 2015, the Seely House was placed on the National Register of Historic Places, giving new hope for the survival of a local symbol of neighborliness. Mamaroneck is 25 miles north of New York City. Heading north on the I-95, take exit 18A and turn right on Fenimore Rd. Turn left on Waverly Ave, left on Old White Plains Road and left on Grand Street, the Seely House will be on the right. To get there by train, walk north-east from Mamaroneck Station, along Old White Plains Road. After three-quarters of a mile, turn left on Grand Street. A former connection to City Island, it has been abandoned since the 1930s.